If you were to fill in the blanks, what would your name tag say? Who am I? Everyone struggles with this question. Some face it in high school, some in college, and others wait years to ask it. It’s tough to confront and deal with, but it’s got to be sorted out. Without knowing solidly who I am, I can’t be truly happy or even relate to others. One of the issues is that people rely on outside sources to determine their own identities. Some take their parent’s perspective on life. Some change themselves based on the latest pop culture fads. Some link themselves to significant others, adapting from relationship to relationship. Some decide their identity based on their hobbies, talents, or occupation. Some run away from themselves for as long as they can stay in hiding. If an “identity” is easy to change to fit surroundings and circumstances, it isn’t really yours. Sure, some of the people you know and things you do can be facets of your identity, but that can’t be its entirety. Without a changeable identity, it’s inevitable that some people will dislike you, but some people will love you. And those are the ones that really matter. The fact of the matter is that I can’t please everyone. I can’t force anyone to like me. I can’t simply go against my personality, even when it would be easier. I can’t wish I were anyone else. It reaches a point where you can take me or leave me, but I’ll still just be me. Sometimes I want to escape. Sometimes I literally want to turn and run so far from all the reminders and the familiarities. Sometimes I just need a change. Change can be good. It can be refreshing. It can be revitalizing. I want to go to Atlantis. It sounds silly, I know, but it is such a fantastical place. It isn’t real. It has no semblance of the world I’m currently surrounded by. It doesn’t have the same problems. Of course, I’d have to swim there, which causes some complications. It’s just such a far out, far away place and that’s what I want to escape to. But escape isn’t the best plan. There isn’t any point in escaping from the problems. Hiding from them doesn’t get rid of them. Eventually, when I came back from Atlantis, the problems would still be there in the bottom of my suitcase. Oh right. That. Right now, I’m learning to grow as my own person. In doing that, I can’t just hide. Instead, I have to overcome. I’ve had the chance to run. I could have given into the temptation of escape. I’ve seen plenty of people do it, often to their own detriment. It won’t do me any good. I can face it. I can overcome. It seems hopeless now, but so long as I don’t flee, I can come out on the other side. So Atlantis can wait. Maybe it’ll make a good vacation spot a few years down the problem. When I don’t have anything negative to hide away in my suitcase. Raven has always been my favorite superhero. For those who don’t know anything about her, her father is a trans-dimensional demon with a lot of built-up hatred. She is the embodiment of the deadly sin pride. In short, her powers rely on energy manipulation and telekinesis. She lives life in constant knowledge that she was born to evil and is destined for destruction. So what does she do? She joins the Teen Titans. Yeah, I know. Poke fun at me for being a nerd as much as you want. But when I was young, I watched the tv show and watched her control her emotions so that she could keep her powers in check. I started doing the same thing. If a kid made me angry at school, I would reign my emotions in instead of lashing out. I’d talk in a cold monotone with no expression. It’s a dangerous thing, keeping emotions pent up like that. As I got older I started being more honest about how I felt. At the time, though, I thought her powers and sarcastic remarks were so cool and so I imitated her. 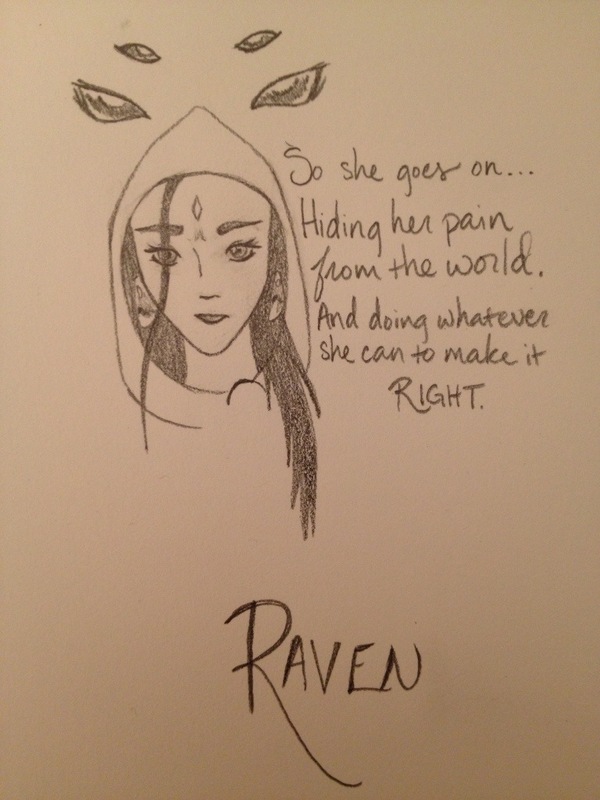 However, when I grew older (and got to reading more of the comics), I began to respect Raven for different reasons. She is still my favorite superhero. I still think her powers are legit. I have a blue cloak and gold belt in my closet, I keep my comics of her in pristine condition, and—as is evidenced by the drawing below—I doodle her all over my sketchbooks, journals, and class notes. Now though, I like her because, despite every opposition and unlikelihood, she reigns her dark side in so that she can save others. She joins the Titans, falls in love with Gar (yes, I do ship them), and makes true friends. She overcomes her hatred and her loneliness and focuses on being a hero. She does the right thing, even when the right thing is so very hard to do. That’s what I want to strive to be like. I don’t want to be Raven in every sense. I’ll pass on the half-demon drama. But I want to do the right thing, even when everything around me is making it difficult. I want to do what I can to be the best person for myself and others. I know I said I’m learning to focus on myself and, sure, I’ll do that over time. It just isn’t so easy for me to stop putting others first. I’ll do what I can and stay true to me. In a sense, I’ll be like Raven. I’ll do my best. I’ll do the right thing. No matter the difficulty. When my friend suggested I spend some time focusing on myself, I’m pretty sure this wasn’t what she meant. I know who I am. I know what I want. I have a fairly solid identity, but I’m not very good at focusing on myself. I have caused myself a lot of pain in the past trying to spare another person’s emotions. Trying to do the best thing. In fact, I did something of the sort very recently. I have been ignoring the pain of it for months but it is becoming overwhelming. Saying I’m emotional right now might be an understatement. The least logical course of action in an emotional time of life is to get a blog. Blogs can so easily be outlets for angst and drama. This isn’t a place for me to rant and I don’t really want to vent. I may post some thoughts, but I’ll do my best to avoid complaints. The fact is, I don’t have many problems. I have steady friends, a family that loves me, and I’m getting an education I want. Not to mention, a journal is much better than the Internet for whining about personal life. But what better way to focus on myself? My resolution is to post something at least every Friday. Yes, I am aware this is Saturday, but I created the blog yesterday and that took a while. I will also be writing 750 words of creative writing a day and that may sneak on here on occasion. I am a writer. I want to write worlds and words and wonders. I can’t imagine that anyone else will read this, but that isn’t the point. I will write thoughts, experiences, inspirations, imaginings, and maybe revelations. A blog will be good for me. I am happy, but perhaps a little perplexed. I’m at a time in my life where I am making a lot of decisions and making a lot of changes. So I’m getting into blogging. That’ll help me figure it all out, right?